To translate this newsletter, see Translation requests/WQ/2. Welcome to the second Wikimedia Foundation newsletter. Inside, you will find news about recent and future events; articles about the latest Wikimedia initiatives; and the thoughts and activities of our Board of Trustees and our founder, Jimmy Wales. You will also find current reports from the community projects, creative work, and thoughts from Larry Lessig. This fall saw a major increase in the visibility of the Wikimedia projects, thanks to a doubling in our server farm and our bandwidth usage; an excellent reception of the "one million article" press release; and growing attention to Wikipedia in an expanding circle of conferences and philanthropies, all bent on changing the world. The number of active projects has recently expanded; see information inside on Wikicommons, Wikispecies and Wikinews. In the coming months, we are preparing for a major Wikimedia conference in August in Frankfurt, Germany; see the Wikimania section on Page 6. Finally, thanks to the many fabulous writers, designers, artists, and translators who make this publication possible. The year 2004 was astonishing not only for the reasons indicated above by Jimmy Wales, but for other reasons, as well. This past year was, especially, one of evolution toward internationality. 2004 was characterized by a phenomenal growth rate of the projects in languages other than English. It was during this year that the number of encyclopedia articles in other languages exceeded those contained in the English Wikipedia. The installation of a multilingual portal at http://www.wikipedia.org, after two years of discussion, further reflects this change. Many local communities are now linked by strong internal bonds and operate autonomously, rather than by copying the operations of the English community. Some have become a source of inspiration for other projects. The number of new initiatives that are born in local communities is striking -- publications in the form of a CD, the cross-project Merry Christmas initiative, Translation of the Week, and, most recently, the International Writing Contest. These projects are described in this publication in recognition of their initiatives. The past year was also a period of meetings of Wikipedians, in person, in cities in many countries, in particular, in Europe and Asia: Paris, Berlin, Munich, Rotterdam, London, Taipei - to name a few. The existence of such active communities is living proof of the global development of our projects. However, communication between the various communities is still difficult, at times. This is not surprising, considering the diversity of the languages spoken by Wikipedians. A publication such as the Wikimedia Quarto would have been in at most one or two languages, a year ago. It is now translated in many languages. Efforts were also made this year to increase interaction among communities, and to improving our meta-site, http://meta.wikimedia.org, which is open to all communities. Translation efforts have been begun to translate key pages on meta and other sites, and to take into account opinions from all projects. The international aspect of our project is also visible in its administrative and legal aspects, through the creation of the Wikimedia Foundation to support the growth and the development of all our projects, and through the election of two members of the Board to represent Wikipedians - both female, as I never tire of saying, as is rare in administrative circles. 2004 also saw the creation of two local associations, one German and one French, and the preparation of other legal structures. In short - three years ago, I joined a small English-language project, located at http://www.wikipedia.com, owned by an unknown American entrepreneur. It was a fabulous project, but it was centered entirely around English, which was frustrating. Today, we are sustained by a non-profit organization, and have evolved into a complex, worldwide, multilingual project. In 2005, I wish for us to increase the number of participants in languages with smaller Wikipedias (such as Arabic), through external collaborations, if necessary. I also hope we will become a resource for readers in countries with little technological infrastructure, where there is no access to the Internet. The participation of editors from all cultures is necessary, too, to reach our objectives of neutrality and balanced perspective. None of us reading this lacks access to information; to the contrary, we are drowning in the excess of information provided by television, radio, newspapers, the Internet, and so on. Our problem is, filtering information, and obtaining reliable information. However, the majority of humanity has no access to most of these information sources, and needs help. We must avoid widening the gap between those who have and those who do not have access to information! Lastly, this is an unhoped-for opportunity for us to discover men and women of all countries, to balance our similarities and our differences, and to attempt to live with, tolerate, and appreciate these differences. In many countries, such differences are regulated with exploding grenades to keep certain groups silent. We have no choice but to find a consensus. We have only words, and must use them. Current information about the Foundation can be found in this quartely newsletter, on the dedicated mailing list , on the Wikimedia Meta-wiki , and at the Foundation's website . The Foundation website was in active development in the early fall : major pages were set up and most were translated into 10 languages. There are currently 38 editors, native speakers of a variety of languages, registered on the Foundation's website; however the site is currently in a rather dormant phase. How does the Board communicate ? Board activities are recorded on the Wikimedia Meta-wiki , and on the Wikimedia Foundation's site . Communication takes place via email, as well as, through the foundation-l mailing list, which is open to the public and publicly archived. Members of the board also frequent the #Wikimedia IRC channel on freenode . The general address, board(at)wikimedia.org, can also be used for any request. However, please be aware that this mail address is no longer a private one. All mails are redirected to a ticket system, OTRS , and may be answered either by a board member or by a few other trusted editors. The OTRS also handles mail about the German chapter, as well as requests for information in English and German. Finally, Jimmy, Angela, and Anthere, being fearless explorers, have all started blogs. Angela’s blog is the richest one  in terms of information about Wikipedia. Please read it if you want information on the latest wikipedia features or anything related to wikisearch. Jimmy  took the opportunity to talk about free software (both in English). Also, Anthere (, in French) decided to use her blog to express her opinions, and to focus on increasing the visibility of Wikimedia projects in the French-speaking world, in the particular hope of reaching out to French-speaking Africa. There have been several meetings of board members over the fall. The board also had the opportunity to meet in real life on a few occasions: in Rotterdam in November, the day following the Wikipedian meeting; and in New York City, before the OSI meeting. Several topics were discussed, including plans for upcoming meetings, whether the Wikimedia Foundation should get involved in political advocacy, how local chapters could be more involved in WMF activity, and free discussion of what the board could become in the future. All these topics were easier to discuss in real life in a youth hostel lounge than on irc or by mail. Michael and Tim Shell were not very active this trimester, although Michael helped with the financial considerations after the last fundraiser. The past months have been very busy for Angela, Jimbo and Anthere, with many good wikipedian meetings (please, see the Meetings report), and interviews with newspapers, websites and radio stations for all board members. Wikipedia is becoming famous now, and our project raises a lot of interest. Jimbo and Angela spent 2 weeks at the BBC (please, see the special report on this), while Anthere was moving into a new house (with plenty of room and a garden but no phone line and no internet connection for several weeks). Anthere was able to keep in touch and active, thanks to her workplace internet connection, and random visits to the local university computer lab, but she had no opportunity to satisfy her true wikipediholism or to access IRC. Anthere appreciated support during her forced vacation, and suggests that all wikiholics use the "Wikipatch"  sent via snail mail by Ryo and notafish. The board made several decisions in regard to membership . The board's vision of membership changed, after much thought and discussions with Wikimedia editors. Initially, it was imagined that much of the income supporting the project would come from subscribing membership fees. Hence, initial plans set membership fees rather high (about 100 dollars.) However, some board members and many editors were not in favor of such a high amount, and it became clear that most Foundation income could come from other sources. Additional discussions led to subscribing membership fees being set at US$36 (for non-editors) and US$12 (reduced). Additionally, discussions with Jamesday and Kate changed the volunteer membership status from being the default status of editors, to being opt-in. The technical development of a membership system will be worked out over the coming months. Are developers currently being paid? In July 2004, the Wikimedia developers were polled about the feasibility of a bounty system for development tasks. This led the board to try out a system of payment and other rewards for developers who choose to work on particular tasks. The board suggested a four month trial run before stepping back and evaluating the system. In the past three months, the board has proposed one task, related to the membership system development -- a task of primary interest to the Foundation itself, and thus, unlikely to be controversial. More than two months after the proposal, Tim Starling made an offer, which was accepted in late November. The feature will be developed against a certain amount of money, at the end of 2004 or in early 2005. No other proposal has been made by the board; one other suggestion was offered by a developer, but has been discarded. This suggests that the prospect of being paid per task is not a strongly motivation for our developer team. Details of the trial run are available at . All Wikimedia contributors will be encouraged to evaluate it when it is over. What is going on with domain names? Jason Richey at Bomis has the full list of names that are registered to the Foundation. Some domains in other countries are owned by other people; for instance, GerardM looks after a few .nl domain names. The french domain name www.wikipedia.fr was taken over by a cybersquatter in fall of 2004. The French wikipedians have decided not to do anything on the matter for now, and the cybersquatter gently redirected the domain to wikipedia, himself. However, the Russian domain name, www.wikipedia.ru, is, unfortunately, being used to make cash by its cybersquatter. Over the next trimester, decisions will bes made regarding which domains to acquire. Many editors would prefer that the domains of all projects be bought for their country's top-level domain; however, the cost of buying so many names is too high for that to be sustainable. The board hopes that registering its trademarks will help alleviate this issue. As requested by several editors, a long overdue privacy statement is under development and should be finalized and translated during the first trimester of 2005. Please do not hesitate to comment on it . Anthere was involved in the creation of the French chapter, Wikimédia France (see the special report on this), and is now part of its board. This became the second of two local Wikimedia chapters, which are based on very different legal constructions, and emphasize the diversity of options for chapters. The French chapter is a legal representative of the Wikimedia Foundation in France. The French and German chapters are both legally based in a country, rather than on a language. However, both wish to expand their activity beyond the borders of their respective countries. Several other projects have discussed the creation of a local chapter in the past few months, most notably the Dutch and Italian wikipedias. Some editors are interested in the creation of chapters based on languages rather than nations, or even a European chapter. Over the fall, there were discussions about the political involvement of the Foundation and of its local branch, Wikimedia France. The board would like to indicate that it does not wish the Wikimedia Foundation to support activism generally, particularly activism not directly related to Wikimedia's work. Any involvement, such as the signature of a petition, should be carefully assessed and done only with the overwhelming support of the community. During the fall, the board discussed both the involvment of local chapter boards and the future of the Wikimedia board, itself. With regards to local chapters, the board is open to discussions with or proposals from the chapters' members. Please be active on this matter. With regard to the board itself, Anthere, Angela, and Jimmy agree that the current situation is hardly sustainable. All board activity is essentially taken care of by three people, and requires the active involvement of other wikipedians to be manageable. It was suggested that the board size, or at least the number of active members, be increased. During November 2004, Angela and Jimmy worked for the BBC in London for two weeks. Everyone had a fine time, and it seemed to be a success; they have been invited to come back at some unspecified date in the future. Some of the BBC employees came to the London meetup held during those weeks. Angela describes their experience elsewhere (see Endnotes, pg. 8). Wikimedia has a standing offer of free hosting from a webhost in France, Lost Oasis, where three new squids have recently been set up. There were other offers of free hosting, as well, particularly while making contingency plans for the first Florida hurricane, in late August; none have yet come to fruition. Much to the disappointment of many Wikipedians, the release by Mandrakesoft of a bilingual snapshot of the French and English Wikipedia, with an upcoming version of Mandrake Linux, has been delayed. The intensive work to tag images and lists in preparation for these publications, which was long overdue, has provided quality improvement to the Wikipedia projects involved. You can help this effort at Wikipedia:Untagged_images. Tokyo meeting, November 8 and Nagoya meetup, November 10. See international notes. Bolzano meetup, November 27 (it and de). See international notes. Taipei meeting (December 4). See international notes. Berlin meeting, December. (). See international notes. Wikimania 2005: The First International Wikimedia Conference  is a conference being planned for all users of Wikimedia projects (August 4 to 8, 2005). See International notes for more on the subject. Daniel Mayer is the Chief Financial Officer. He is responsible for finances, with the oversight of Michael Davis. In particular, he is in charge of establishing our budget and balancing our books. Contributions from January through August, 2004, averaged 200 USD per day. A two-week fundraiser in September 2004 raised 60,000 USD, slightly more than the $50k goal. Around 10% of these contributions were made directly to the German chapter. These funds have sustained the project through the fall. At the current rate of expenditure on bandwidth and machinery, that is enough to keep the site up and growing for four months. The next fundraising drive is planned to start early February 2005. An open meeting to discuss how else we could support the project's long-term growth is planned to take place before then. The approved budget for Q4 2004 can be seen here: . This budget proved generous; total expenses for the quarter have only come to a little over $50k, thanks, in part, to a few in-kind donations. The next formal budget review, including a detailed breakdown of donations since the last fundraiser, will be available in January. Most of the below report has been written by James Day; the part on the Paris machines is largely by David Monniaux. Information about our servers may be found any time at Wikimedia servers. Developer activity falls into two main areas: server maintenance; and development of the MediaWiki software, which is also used for many non-Wikimedia applications. Most developers (though not all, by their choice) are listed here. One may show appreciation for their dedication by thank you notes or financial support. Thank you ! Until now, all developers have been working for free, but that may change in the future in order to support our amazing growth. On December 18, 2004, 3 donated servers were installed at a colocation facility in Aubervilliers, a suburb of Paris, France They are named bleuenn, chloe, and ennael by the donor's request. For the technically-minded, the machines are HP sa1100 1U servers with 640 MiB of RAM, 20 GB ATA hard disks, and 600 MHz Celeron processors. The machines are to be equipped with Squid caching software. They will be a testbed for the technique of adding Web caches nearer to users in order to reduce latency. Typically, users in France on a DSL Internet connection can connect to these machines with a 30 ms latency, while they can only connect to the main cluster of Wikimedia servers in Florida in about 140 ms. The idea is that users from parts of Europe will use the Squid caches in France, to reduce by 1/10 second, access delays both for multimedia content for all users and for page content for anonymous users. Logged-in users will not profit as much, since pages are generated specifically for them and, thus, are not cached across users. If a page is not in a Squid cache, or a page is for a logged-in user, the Apache web servers must take 1/5 to three or more seconds plus database time to make the page. Database time is about 1/20 second for simple things, but can be many seconds for categories, or even 100 seconds for a very big watchlist. The Squid caches were activated in early January 2005, and an experimental period ensued. As of January 31, the machines cache English, French, and multimedia content for Belgium, France, Luxembourg, Switzerland, and the United Kingdom. The system is still somewhat experimental, and it is expected that caching performance can be increased with some tuning. The installation of similar caching clusters in other countries is being considered. In mid-October, two more dual Opteron database slave servers, with 6 drives in RAID 0 and 4GB of RAM, plus five 3GHz/1GB RAM Apache servers were ordered. Delays, due to compatibility problems, which the vendor had to resolve before shipping the database servers, left the site short of database power; until early December, the search function had to be turned off, at times. In November 2004, five Web servers, four with high RAM (working memory) capacity used for Memcached or Squid caching, experienced failures. This resulted in very slow wikis at times. Five 3GHz/3GB RAM servers were ordered in early December. Four of the December machines will provide Squid and Memcached service as improved replacements for the failing machines, until they are repaired. One machine with SATA drives in RAID 0 will be used as a testbed to see how much load such less costly database servers might be able to handle, as well as providing another option for a backup-only database slave also running Apache. These machines are equipped with a new option for a remote power and server health monitoring board at $60 extra. This option was taken for this order, to allow a comparison of the effectiveness of this monitoring board with a remote power strip and more limited monitoring tools. Remote power and health reporting reduces the need for colocation facility labor, which can involve costs and/or delays. A further order of one master database server, to permit a split of the database servers into two sets of a master and a pair of slaves, with each set holding about half of the project activity, as well as five more Apaches, is planned for the end of the last quarter of 2004 or the first days of the first quarter of 2005. This order will use the remainder of the US$50,000 from the last fundraising drive. The database server split will allow the halving of the amount of disk writing each set must do, leaving more capacity for the disk reads needed to serve user requests. This split is intended to happen in about three months, after the new master has proved its reliability during several months of service as a database slave. Traffic grew during the third quarter of 2004 from 450 requests per second at the start of this period to 800 per second at the end. In the early fourth quarter of 2004, that rose further, with daily peak traffic hours exceeding 1,000 requests per second (). Average bandwidth use grew from 32 megabits per second (mbps) at the start of the fourth quarter of 2004 to 43 mbps at the end. Typical daily highs were 70 mbps, sometimes briefly hitting the 100 mbps limit of a single outgoing ethernet connection. To deal with this traffic, Dual 100 megabit connections were temporarily used, a gigabit fiber connection was arranged at the Florida colocation facility, and the required parts were ordered. Memorial Wiki is currently only a 9/11 memorial of 200 pages and not a project proper. Due to the multiplication of new projects and controversy over the creation of wikispecies, a procedure for starting new projects has been set at New project policy page. Wikinews was the first new project to follow this procedure, which requires an extensive description of the project, the translation of this description into several languages, an positve approval poll by the community, and a final approval by the board of the Wikimedia Foundation. There were a few major news events this fall: the "one million-article" press release, which was picked up around the world in over ten languages; the press release about the German Directmedia CD, which was picked up widely in Germany; and the launching of Wikinews, which was heavily reported by reporters and bloggers in many languages (please, see In the Media, pg. 7). During this trimester, it was noticed that several of the larger wikipedias, aside from the English one, were beginning to receive important media coverage. For example, the French wikipedia was the subject of several very good articles. Among them, was one in Liberation (), as well as, a very critical one in Charlie Hebdo (). On November 27th, 2004, Anthere participated in a radio interview at radio BFM (please, see ). Another radio interview occurred, featuring Yann :  in January, 2005. For quotes from articles about Wikipedia and other projects, see "In the Media", pg. 6. On November 17, I did my first ever radio interview for Wikipedia. It was for BBC Radio 4's You and Yours programme. I didn't realise it was going to be live when I agreed to do it, but it turned out less terrifying than I imagined it might be. It was recorded at the BBC Suffolk studio in Ipswich, since the BBC Essex studios, which are closer to me, were fully booked at that time. I was invited to wait in the "Green Room" when I arrived, which wasn't as impressive as it sounds; it was a room with some sofas, drinking water, and press clippings about BBC Radio Suffolk. Shortly before the recording began, I was taken into a small studio and given some headphones, where I could hear both the programme and the editor in Manchester talking to me. I was left alone in the studio during the recording. Bamber Gascoigne started by giving a potted history of the encyclopedia, and, then, a recording was played of a family searching for facts in a traditional encyclopedia, compared to one using the web. Michael Schmidt, an English professor at the University of Manchester, Institute of Science and Technology, then talked about how his students nowadays were more likely to use computers than books for their research. The presenter, Liz Barclay, asked me to distill how Wikipedia works, and I explained how the site is editable by any visitor, and how vandalism is quickly discovered and reverted. Bamber was at a studio in London, and talked about his HistoryWorld site. Bamber and Michael both felt that Wikipedia articles should be "arrested" at some point to prevent editing. But, I suggested that instead of locking articles permanently, a version of an article could be marked as stable and could be given to users who wanted that, whilst still allowing other users to edit the live article. This section of the programme lasted just under 20 minutes and concluded with Bamber saying "the idea that encyclopedias [which are printed] are reliable is nonsense". A great deal has been written and said about Wikinews, almost rivaling the total amount of content written for the project since it began in November. Some love it, Some hate it. All in all, it has acquired around 200 articles, along with a fair bit of on-wiki policy debate and a core group of 8 or 10 active contributors. See how full article about it below. See the latest paper publication in progress in the Wikijunior report below. In January 2005, the Wikipedia website changed its main page from the English main page to a multilingual portal showing all Wikipedia languages having over 100 articles, after more than two years of sporadic discussion. When it was created, the English Wikipedia was located at www.wikipedia.org (originally www.wikipedia.com). Other languages were assigned domains based on ISO 639 language codes. The English Wikipedia was eventually moved in October 2002 to the appropriate domain for its language code, en.wikipedia.org, while the previous domains were set to redirect people to the correct location. The move to create a portal was supported by the board and acclaimed by Wikipedians from other languages as long overdue and a true sign of the multilingual nature of the project. However, the change surprised a number of people and upset some users of the English Wikipedia who disliked the new arrangement. Read more of Michael Snow's report here. () in English and German was officially launched in December 2004, followed by the Dutch version in January 2005. For the first time for a new Wikimedia project, it has gone through brainstorming, multilingual community-wide voting, and the approval of the Board of Trustees. Erik Moeller (aka Eloquence) spearheaded the drafting of a proposal to organize the vote, in addition to laying out the basic site structure and workflow. Even though it started as a demo version, bloggers, slashdot.org and mainstream media outlets have taken notice. The biggest question probably was whether the success of Wikipedia could be replicated for news production. Many of the experienced Wikimedians worried that biased news, incompatible with our policy of neutral point of view, might be released in the much shorter cycle of work that is news production. Conclusive answers to these questions have not yet been discovered, although we have seen significant progress on the project. Wikinews has now entered the "beta" phase. It is still in its formation phase but its existence as a Wikimedia project is now generally accepted. Erik wrote an essay reflecting on the project's past and future, and pointed out that the formal review process is being reconsidered and redesigned leading to a simpler, free-flowing mechanism. There is tension between making the site more newcomer-friendly by simplifying rules and procedures, sticking to the wiki principle of "anyone can make any edit", and imposing quality assurance measures - a formal review process with a specific set of rules to follow. Publication of unreviewed and incomplete stories on the main page has likewise been discussed. Some active users, including IlyaHaykinson, TalkHard, and Lyellin, have written at length on the topic. Considering that around half of the new contributions are written in the area of politics and conflicts, it is quite normal to worry about bias and accuracy. Some think that we should emphasize in-depth coverage like that of weekly news publication rather than breaking news, and spend more time on quality control. Calrosar, one of the many active participants on Wikinews and a participant in many discussions of article neutrality, observes that Wikinews is getting better and producing positive results. Nevertheless, the project faces great challenges. Many have said that creating a truly free, open and neutral news source would be more difficult than even the creation of a free encyclopedia. We welcome all editors on other Wikimedia projects to come by, participate in discussions, write articles, and help build the communities that we have already started. Carlosar:  and other sections on the page. Approximately 2,000 pages and 150-200 articles. 150 categories. 800+ registered users, 8000- edits. Started by Danny at the end of October as little less than a challenge, after the success encountered with the translation of Gangnihessou into various languages, the Translation of the week, a project designed to translate an article across the different language wikipedias has picked up very well, and counts 10 translations to this day. The idea behind the translation of the week is to choose an article in one of the wikipedias and present it as candidate for a cross-wiki translation. Articles that reach a majority of supporters are then put up as Translation of the week and set to be translated in as many languages as possible. After 10 weeks, the project counts 64 declared participants, and surely that many more across the different wikipedias. Although the record established by Gangnihessou, translated into 40 languages, has yet to be matched, no article has been translated into less than 16 languages. Proof our efforts are being recognised as legitimate, the Beck Foundation approached Wikimedia a while ago, asking whether we could develop educational materials for a younger audience. After a proposal was submitted, they agreed to grant us US$10 000 to create an online and print project for 8-11 year olds. The project was initially greeted with a bit of distaste on the Foundation mailing list, and was called dubbed as being another Wikispecies, a project created by the Board with little outside input. But once development started on Meta, the project has become more structured in its focus, and gained unanimous support and encouragement from every Wikimedia contributor that has discovered it. Once completed, our books will be available worldwide, either for free, or at a cost affordable to local children, rather than just their parents. Glossy and full colour, these magazine-style booklets will be colourful and richly illustrated, to help encourage literacy and curiousity. The project is currently being developed as part of Wikibooks. Once we've created our first booklet, the information will be transferred to a non-editable site for our readers. All of the content will be reviewed and verified by qualified educators. One of our greatest challenges so far is adapting our writing styles and content for kids. Contributors walk a fine line between too fluffy and too nerdy. Eventually, as we venture into other topics, we'll also have to decide between censorship and tastefulness. The first topics are safe from any such issues; Big Cats, the Solar System, and South America are the first books the community decided to put into development. There's also been some interesting experiments in how to layout multiple levels of content at once. The South American issue seems to be developing the quickest, thanks to the help of Wikimedians from the continent. We've already had translation offers for Danish, French, Portuguese, Spanish, and Swedish. Our eventual goal is for these projects to develop content independently of the English project. Additional grants will be needed to create print editions of all other languages. I encourage everyone to come and see what Wikijunior's shaping up to be. Contribute some info, list yourself as an eligible translator, debate over the project's name. Wikijunior will hopefully lend more creditablity to the Wikimedia name, as one of our first projects to have truly noticable results in the real world. Right now, the Spanish Wikiversity is growing quite faster than "Wikilibros" (Spanish Wikibooks). It seems that the foundations of this project are getting stronger as we already have Schools with active members in Chemistry, Physics, Computing Science, Philosophy and Linguistics. Especially active at the moment are the School of Computing Science (Escuela de Ingeniería Informática), with 7 members, 8 departments and 1 university course outlined; the Physics Department and the Chemistry Department have also very active members and the Department of Linguistics have a recently created Area of Synology. In the "Claustro" we discuss how the organization of the Wikiversity should be. One of the topics being discussed is if we should propose to Wikimedia community that the Wikiversity should be an independent project from Wikibooks, with or without another domain name (for example .wikiversity.org). Actually, eventhough Wikiversity may/should use Wikibooks to create didactic material, different departments may be involved in other Wikimedia projects. For example, the "Area de Sinología" is going to begin the Chinese-Spanish and Spanish-Chinese section of the Wiktionary and also the article "Literatura de China" from the Wikipedia. So, the vision of the Wikiversity is quite wider than Wikibooks. It involves and tends to get profit and participate in all the projects from Wikimedia. I encourage you to have a look and to participate :P. What? don't you have a Wikiversity in your language, and what are you waiting for creating it ;-)? Ar: A lot of effort is put into improving the existing articles, with some new additions everyday. No special projects are currently going on. En : In light of the size of Wikipedia, it's increasingly difficult for people to keep track of significant happenings in the community. Michael Snow has made a new effort to collect this information by actually writing about it and has started a newspaper called The Wikipedia Signpost. The paper is planned to be published on the weekly basis. Read it at: Wikipedia Signpost. Es: A very successful project called País de la Semana (Country of the Week) encourages contributors to enhance the article of the country chosen for that week. Countries with little to no information are prioritized. Ja: Japanese Ministry of Land, Infrastructure and Transportation (MLIT) clarified that their aerial photos are available under GFDL. This is a big good news for us, because fair-use images are not accepted for legal reasons on Japanese Wikipedia. Our big thanks go to the effort of User:っ and the magnanimity of MLIT. e-Goat. (PDF source) In Japan, Wikipedia.org traffic has grown 635% over the past year, the biggest spike on the japanese web by a wide margin. Wikipedia is currently 7% as popular there as the country's most popular site, yahoo.co.jp. Zh: The long-requested feature - Traditional/Simplified Chinese automated conversion - are coming with MediaWiki 1.4, which will attract more traditional Chinese users to Mediawiki projects and reshape the community. We owe Zhengzhu a lot for this wonderful work. It : One Christmas tradition is sending Christmas and New Year cards, and the text on an Italian card would be “Buon Natale e felice Anno Nuovo”, on an English card “Merry Christmas and a happy New Year!”. Buon Natale e felice Anno Nuovo! is the leading page for this effort. What we want is the translation for as many languages as possible but certainly one for all each language that has a Wikimedia project AND a sound file with the pronunciation on Commons. One way in which you can extend this project is by writing about the way Christmas is celebrated in your area, tradition or country. Many Christians do celebrate Christmas in January for instance and not in December. Not everyone knows about a “Christmas pudding” for instance and snow should go with Christmas but not in Australia. Buon Natale is a page where you can find many resources about Christmas"""
The first two Wikimedia chapters, based in Germany and France, were founded this year. Both chapters have elected boards and are now active in their respective countries. Groups of Italian, Dutch and Romanian wikimedians expressed interest in forming their own chapters this fall, and held a few meetings, online and in person, to discuss the details. The Romanians in particular already drafted some bylaws (). A common sticking point for all of these chapters, both formed and proposed, is whether to create a chapter for a particular country, or one for a particular language, or neither (for instance, there is interest in forming a European chapter, which would have a changeable regional affiliation and no language affiliation at all). Interim reports on the Italian and Dutch deliberations can be found here and here, respectively. Wikimedia Deutschland () has been busy with a lot of administrative tasks. The German chapter has succeeded in gaining official status as a tax-exempt, non-profit organization. To resolve some repeatedly asked questions about the impact of copyright laws and the GNU FDL on Wikipedia, Wikimedia Deutschland has ordered a legal FAQ for the German Wikipedia from a German lawyer who specializes in Open Source and Open Content license issues. At the end of September, Wikimedia Deutschland, together with the Stuttgart Region Economic Development Corporation (WRS) and Prof. Deborah Weber-Wulff from the University of Applied Sciences (FHTW) in Berlin, began working to participate in a well capitalized research project developed by the German Federal Ministry of Education and Research (BMBF), called "New Media in Education ." Two applications have finally been submitted; the selection process will continue until the end of the year. In early October, Wikimedia Deutschland established contacts with the OSCE, which organised the "OSCE Human Dimension Implementation Meeting " in Warsaw, where Jimbo Wales gave a speech about Wikipedia at the panel "Guaranteeing Media Freedom on the Internet." Later that month, a team from the German chapter represented Wikipedia at a booth and gave a speech at Berlinux, a Linux congress in Berlin from the 22nd to the 23rd of October, 2004. Rumours exist that John "maddog" Hall was seen wearing a Wikipedia T-Shirt there. Contacts with the Brockhaus publishing house were strengthened at several meetings, as well as contacts with Directmedia, a company from Berlin, which produced the CD version of Wikipedia. The Wikipedia CD release received several favorable reviews in the German media and was distributed on the cover of the computer magazine Chip. Directmedia currently plans a DVD version of Wikipedia for spring and invited us to share their booth at the Leipzig book fair, which is in the immediate neighbourhood of Brockhaus'. In December, Wikimedia Deutschland attended the 21C3, the annual Congress of the Chaos Computer Club. Jimbo Wales gave a presentation about Wikipedia. And, Wikimedia Deutschland invited two of the main developers of the MediaWiki software, Brion Vibber and Tim Starling, to meet for a Mediawiki conference there. In the last three months, there have been numerous mentions of Wikipedia in the German-language press. For example, Tageszeitung featured an article on Wikipedia, and Bild-Zeitung, Germany's biggest tabloid, published an article with a "how-to" on Wikipedia. The start of the new Wikinews-Service has been very well received by German journalists, although de:Wikinews is still at its very beginnings. Wikimédia France (), a French non-profit association, was officially founded on October 23, 2004 in Paris, with 20 founding members. Among the founding members were the Board of the Wikimedia Foundation. At this meeting, the final bylaws were adopted. The goal of Wikimédia France is to promote all Wikimedia projects, with a focus on French language projects. Wikimédia France will also act as a representative of the Wikimedia Foundation in France and other countries, where its help is required. It will not exercise any editorial influence on the French-language Wikipédia, and may intervene only statutorily in the case of legal matters. The founding members and other interested users are working to establish a set of internal policies for Wikimédia France, in order to further define its goals and methods. Wikimédia France elected its Board members on October 25th via IRC. Ryo was elected president, Yann, secretary and Shaihulud, treasurer. The last step is to register the association as a non-profit with the French authorities, and for this it is necessary to have the bylaws signed by all founding members. The last missing signature was Jimbo's. Since the signed bylaws have just been returned to France, it is expected that the association will legally exist in February 2005. This will enable Wikimédia France to function as a legal entity and, for example, to open a bank account. Some early goals will be for the association to be recognized as an organization of "public usefulness" and to have membership fees that are partially deductible from income taxes. After that, the real work of setting up accounts, getting donations and such can begin. Wikimédia France have had a few occasions to present Wikipedia in different meetings. Please see  for more details. Wikipedia lately received a lot of coverage in French language medias: articles from maintream newspapers Libération and La Tribune de Genève, the radio France-Info, the magazine Univers Mac and many web site reviews. Here is a look at what the media (in all its forms) has to say about Wikipedia, be it good, bad or indifferent. 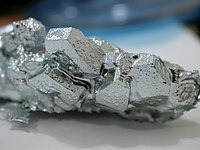 Up until now, Wikipedia has hogged the media spotlight; here we find some excerpts about its sister projects as well. 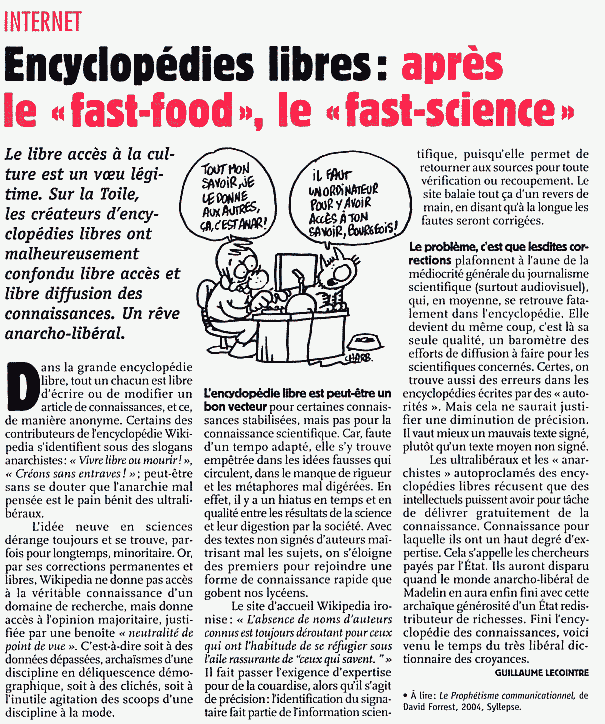 Nov : Après le "fast food", le "fast science" --Charlie Hebdo. Special coverage : Coverage has included the million article milestone, comparison tests against other encyclopedias, and the hot and heavy editing that preceded the US elections. Howard Rheingold, according to the International Herald Tribune, Sep 11. Lyndon LaRouche(?!?! ), according to the (Ohio State University) Lantern, Oct 4. Wikimania 2005: The First International Wikimedia Conference () is a planned conference for all users of Wikimedia projects (4 August 2005 to 8 August 2005). The event will include speakers from within Wikipedia and from outside Wikipedia as well. One of the purposes of the conference will be to have people meet and learn about other language projects. Frankfurt was chosen as location for the first Wikimedia conference in Summer 2005. In mid-November, Jimbo Wales, Arne Klempert, Mathias Schindler and Elian inspected the place for the meetup, the Haus der Jugend, and talked to possible sponsors. The Haus der Jugend turned out to be great, a mixture of ancient and new buildings, set around a beautiful courty yard. We booked nearly the entire building for the time from 4th to 8th August, a big conference hall for 400 people, several smaller halls and about 300 beds. As next steps we will work on setting up the reservation system for participants and issuing a Call for papers. There are three days of activity and two days of conference planned for the first annual Wikimania event. There will be technical, academic, and business presentations about wikis and the wikimedia projects. Both housing for the event and conference space will be provided by the main youth hostel / social center in Frankfurt am Main, Germany, a frequent venue for non-profit organizations. You can register your interest in attending, and find out more about the schedule and location, at the Meta page on the subject (). Italian Wikipedians held a meeting in Bolzano on the same day of the presentation of Wikipedia at the LinuxDay conference (nov 27th). One of the main topics was the formation of the Italian local chapter; some German Wikipedians have also participated, and their experience with their own local chapter formation was valuable. Some important points have been accepted: a draft of the Bylaws for the Association is to be created and discussed by chapter and the Association can be a "onlus" or any other non-profit type. The status of administrators is currently under discussion with various polls on the Italian Wikipedia. In the meantime it has been decided that those who are not active, have to appear separately in the list, in order to avoid that users can contact them and complain about receiving no feedback. In the end, there was a point about usage of categories in substitution of the lists, where the list still presents missing articles, they can be transferred in the editable part of the category. The Taipei meetup was held on 4th Dec. There was a very rare winter hurricane raiding Taiwan on that day. In the afternoon, the heavy rain stopped , and the meetup began in Yun-men Café near Taipei Railway Station. Four Wikipedians, their friends and one reporter from the United Daily News joined the meetup. Traditional/Simplified Chinese automated conversion which is coming with MediaWiki 1.4 was discussed first, and this feature will be very helpful for attracting more Taiwanese to attend our projects. Then Taipei Wikipedians gossiped about different styles of Wikipedians’ personality in ZH Wikipedia, which was an interesting topic. As Yahoo Taiwan introduced a new online community - Yahoo! Kimo Knowledge+, and meanwhile in Mainland China, Sina.com also introduced a very similar project – iAsk. In their communities everyone can ask and answer questions, and their content are also organized by questions. The difference between Kimo Knowledge+ and Wikipedia was discussed, and all the participants thought ZH Wikipedia should introduced some award system just as Kimo Knowledge+ and iAsk are doing -- although there are the WikiMoney and Barnstars System in English Wikipedia that had been known by ZH wikipedians. Finally the group talked about recruitting newbies. Should there be some special propaganda or just spontaneous growth of the community? It's really a good question to think about. During the months of October and November, Japanese Wikipedians had three meet-ups in three cities, Osaka, Tokyo and Nagoya. Some Wikipedians in other cities like in Yokohama joined. Participants ranged from a high school boy to a couple in their 40s. French user Aoineko in Yokohama brought a trophy to Tokyo meetup. It had been awarded from Japan Advertisers Association to Japanese Wikipedia in September and would be later sent to Jimbo. Conversation topics included plans to improve the self-governance of Japanese projects, recent significant activities of Wikipedians and their own activities on Wikipedia. The 21st Chaos Communication Congress (21C3) was held in Berlin at the end of December, 2004, and provided a chance for many Wikimedians and MediaWiki developers to meet up. For many of the developers, it was their first chance to have face to face discussions about the future direction of the software. The conference included the themes of hacking, science, community, society, and culture, and included two Wikimedia related talks and two workshops. Tim Starling and Brion Vibber made a presentation entitled "Edit This Page Scaling the Wiki Beyond 1 million" as well as moderating the MediaWiki Developer Workshop which discussed both the current software, and ideas for future features of MediaWiki. Their presentation discussed both hardware and the software issues, with information on the implementation of compression algorithms. Jimmy Wales spoke about "Wikipedia Sociographics: What the wikipedia community doesn't know about itself" where he explained different roles within the community, and explained how Wikipedia is not created by a million people adding one line, but by a community of users who trusted each other working together. Elisabeth Bauer, Angela Beesley, and Jimmy Wales moderated a Wikimedia Collaboration Workshop. Topics discussed included the role of the Foundation, International cooperation, and the Wikimania conference. The Wikipedia area on the ground floor, with sofas and a mattress, was a meeting point for Wikipedians and gave the opportunity to sell Wikireaders and Wikipedia CDs and to promote Wikipedia to other conference attendees. The time in Berlin was also used for a meeting about the Wikimania event, and plans for speakers and other aspects of the event were able to be discussed offline. A thesis on Wikipedia has been written by an italian wikipedian, Vala. The thesis may be found on Wikisource, it's in Italian (English version is here. The work of this thesis focuses on the issue, often debated, of the “collective production” of knowledge, which for more than 40 years has been taking shape in contemporary media, characterized by the centrality of computers as a tool of “knowledge sharing” and as a “relational instrument”. In particular, the thesis discusses the collective production of knowledge in its online dimension, and specifically, inside the Wikipedia project, as an emblematic work in the treatment of this argument. Beside in-depth empirical research inside the Wikipedia community (“virtual ethnography” combined with “participative observation” in meetings, and offline interviews combined with interviews directly on the net), we trace a complex route from the first steps in the phase of social construction of the PC, to critical analysis of the production model and social ensemble, which comes closer to that observable within Wikipedia: that is to say, open-source, analyzing in particular the thoughts of its two main theoreticians: Richard Stallman and Eric Raymond. Then we look at the interventions that best seem to contribute to clarifying the socio-structural form sustaining the cooperative production of knowledge on the net: that is, with the structural theory of networks and emerging systems, as formalized by Albert Làszlò Barabàsi, and with the theories of complexity and emerging systems, at least as revealed in the field of human sciences. Starting from this theoretical frame, we came to an original result in the research sphere, recognizing in the Italian edition of Wikipedia a hybrid model, on one side recalling the dynamics of emergence and of complex systems, on the other presenting more typically communitarian aspects, such as have been described in the vast literature on virtual communities. Following a presentation Angela Beesley and Jimmy Wales made to staff at the BBC in August 2004, they were invited to spend two weeks at the BBC offices in Bush House, London in November. The two weeks were spent presenting Wikipedia and the other Wikimedia projects, along with the MediaWiki software they run on, and the principles of free-content and open communities to a range of staff across many divisions of the BBC. They spoke to around 150 people, a very small fraction of the 27,000 people who work for the BBC. The presentations varied according to whether they felt the division could benefit from using Wikipedia content or whether they should be creating their own communities to create content for the BBC website. In terms of linking to Wikipedia, Jimmy and Angela discussed the Producers Guidelines with the search department, and with the editorial policy department, so see if there were reasons the BBC could not recommend Wikipedia pages in their search engine. An outdated page in the search department's wiki suggested a "three click rule" might prevent this, but the more recent guidelines suggested this shouldn't be a problem. Following a presentation about Wikimedia's projects to the online News department, the questions focused almost exclusively on the recently launched Wikinews projects, with many queries about how it would be policed and how it could be trusted. It was explained that the site was currently focusing on making summaries of existing news sources, rather than original reporting. For the presentation to the Radio and Music department, there was a mock up of how Wikipedia content would look on the site, compared to the existing content the BBC licenses from Muze. Later, there was much discussion about the differences between the h2g2 and Wikipedia communities, and how the top-down processes used on the BBC site could be reduced. During the first week at the BBC, Paula LeDieu came to discuss the Creative Archive. This archive incorporates all of the BBC's archived television and radio footage, which is planned for release under a Creative Commons licence. The licence is going to be non-commercial, and potentially only for use within the UK. Since the BBC is not the rights holder to much of the content, the difficulties of getting people to agree to a free licence is one of the reasons for the choice of a non-commercial use licence. The Sport department appeared the most keen on making use of Wikipedia content, and also in forming communities of their own. They want to have more content on minority sports, and were interested to learn how this could be done more cost effectively by allowing fans of these sports to add the content via wikis. The People's War site is due to close its doors to editing. We discussed with the people working on this what their plans for the site would be when the project finished. Although contributors of the stories hosted on the site agreed to the BBC's terms and conditions which allow the BBC to sublicense the content, it was felt that releasing it under the GFDL and potentially having the content used in inappropriate ways would be unacceptable to the community. Alternatives proposed included keeping the existing stories static, but allowing the community to continue building around the site, adding metadata and factual information related to the stories. What's happening across the wikiverse and beyond. The most exciting upcoming event is Wikimania, the first international Wikimedia event, August 4-8. Wikimania will feature both academic presentations and a social gathering of hundreds of Wikimedians for the first time ever. What will happen? Will the atmosphere ignite? It's impossible to know for sure, so bring your confetti. 21-26 Mar - New Delhi, India. Doors of Perception conf [JW] "platforms for social innovation"
Interested readers should be able to see this newsletter published in April. Keep an eye on the newsletter page on meta for new information, or to sign up to receive newsletter updates by mail. Look for the next edition in the spring, and keep the good work and suggestions coming! This page was last edited on 8 July 2018, at 17:56.